How to get the best from Pet Remedy. A great advantage of Pet Remedy apart from being a natural option, is the unique way in which it works. It starts to help instantly and is very gentle in its calming effect. The low concentration Valerian based formulation works with the pet’s (all mammals, birds, and reptiles) natural calming pathways. This means the actives in the Pet Remedy formulation mimic GABA (the natural calming agent in mammals) and thus help trick fired up / excited nerve cells (when the pet is stressed or anxious) into thinking they are getting a message from the brain to calm. Remember Pet Remedy only helps calm excited nerves so there is still this matter of learnt (reactive) behaviour to deal with. Often your pet will still react / behave for a while in the same way as when stressed or anxious even if their nerve cells are calmed. For instance if the doorbell goes, a dog may still react by barking. But once calm, the pet becomes more settled and more receptive to you, so you can then work on developing confidence and work on behaviour modification. 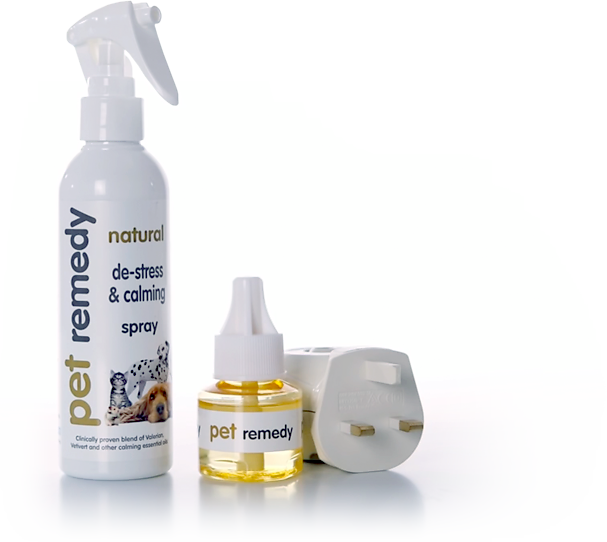 Pet Remedy is now used on a daily basis by vets, vet nurses, rescue centres, pet professionals (such as behaviourists, trainers, and groomers), and even zoos all over the world! Starts to help instantly and will help with separation anxiety, bonding, fireworks , new home, bereavement, new pet in home, and any other stressful situation.